Science on the Run: Drills, What Are They Good For? | Run S.M.A.R.T. Science on the Run: Drills, What Are They Good For? It’s likely you’ve heard that running drills will improve your technique to make you a more efficient runner. Some coaches claim that running drills are effective by way of simulating individual running phases, seeking to correct technique. However, research has shown that the method of performing those classic ‘As, Bs and Cs’ do not mimic the same muscular activation patterns as in running. Personally, I see a lot of value in performing drills that gets the athlete practicing quick feet, explosiveness and maintaining good posture. They’re also a great way to warm up for a speed workout after a light jog – along with strides they prepare the body for quick movement and increase dynamic range of motion that would not be achievable through static stretching. Don’t just take my word for it – a recent article presents a study where the effects of running drills during an interval-training program affected biomechanical parameters of running. Here’s how it went: 30 recreational runners were divided into two groups and underwent a 15-week interval-training program. One group received running drill instruction as part of the training in order to measure the effect of drills on performance when combined with an interval-training program. A variety of biomechanical variables were analyzed both before and after the intervention, at a each participant’s comfortable and maximum running speeds. The result: Because of the study design (intervals vs. intervals + drill training), the researchers are able to confidently conclude that running drills in a 15-week interval-training program does not appear to be an efficient way to improve performance. The main finding was that comfortable and maximum running speeds increased for all runners, with no significant differences between either of the groups. This was due to the interval training alone. 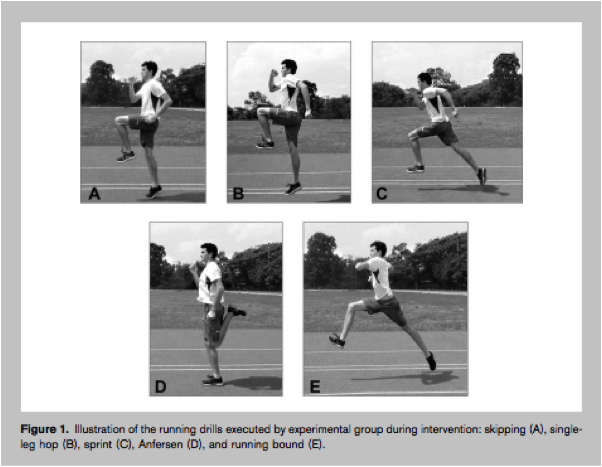 What this means: Interval training is truly effective at improving parameters related to performance – and maybe general drills are not necessary for a group of runners training as a cohort. A final comment: Technique work alone is not the only way to improve running efficiency. A new runner must spend lots of time simply running in order to adopt their body’s most efficient way to run based on its current condition (strength, flexibility, anatomy). Once established, a runner can attempt to improve technique through drills, but also through specific cues and strength, speed, and flexibility training. Running technique changes should be approached with guidance from a biomechanist, coach, and/or physiotherapist. Nikki Reiter is a Biomechanist and certified NCCP Performance Coach in Endurance Running. She offers online gait analysis through Run Right Gait Analysis. Visit her website www.run-right.ca for more information.